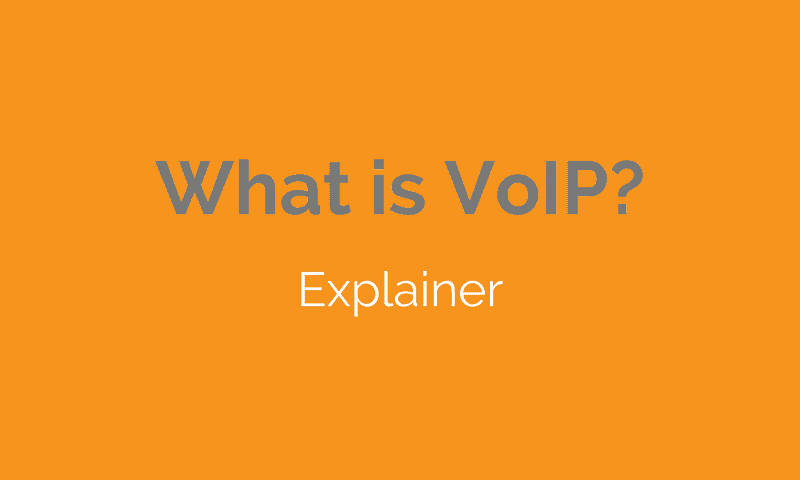 What is VoIP? At the most basic level, VoIP can be described as the general term for making and receiving phone calls over the internet. Below we’ll talk about how this works by explaining the key elements, as well as a few of the features and advantages of using VoIP in a business environment. When you speak into a telephone, your voice is converted into data and sent down a series of connected wires. With VoIP, instead of being transmitted over a telephone network, the voice data is broken up into many small packets and sent over an internet telephony connection in a similar way to other types of data. The device which receives your voice as an input could be a number of things, from a desk telephone handset to the microphone in a headset to a smartphone supporting mobile VoIP. Now we can begin to see that VoIP calls involve complex connections and interactions. So time for a better definition then: VoIP is a group of technologies and methods used to carry calls over a data network conducted via IP (Internet Protocol). How is VoIP used in cloud call center software? What are the advantages? The initial appeal of using VoIP services is the potential for cost reduction. Because the voice data is not carried over a dedicated voice network and is instead prepared for travel over a data network, operational expenditure can be cut by 20-30%. From a device perspective, enterprise VoIP services appeal because they are focused on software and hardware connectivity. Traditional telephony devices can be made to work by using SIP trunking, and SIP phone applications can be installed for free on desktops. As well as this, there is the suite of services which VoIP simplifies for business, all configurable from a computer interface: call forwarding, automatic calling, business process integration, PBX, voicemail recording management, unified communications, automatic call distribution, skills based routing… the list goes on. VoIP often opens up new service horizons for businesses who are still using legacy systems. With Transparency Market Research predicting the global VoIP services market to reach 348.5 million subscribers with a revenue of $137bn, the question ‘what is VoIP?’ will be heard less and less in the coming years. Due to its increased flexibility and reduced cost, VoIP technologies are here to stay.